Since the rise of on-demand food delivery apps, I’ve definitely found myself reaching for my phone more often. It definitely helps when the selections are a lot more interesting than greasy Thai or greasy Indian. 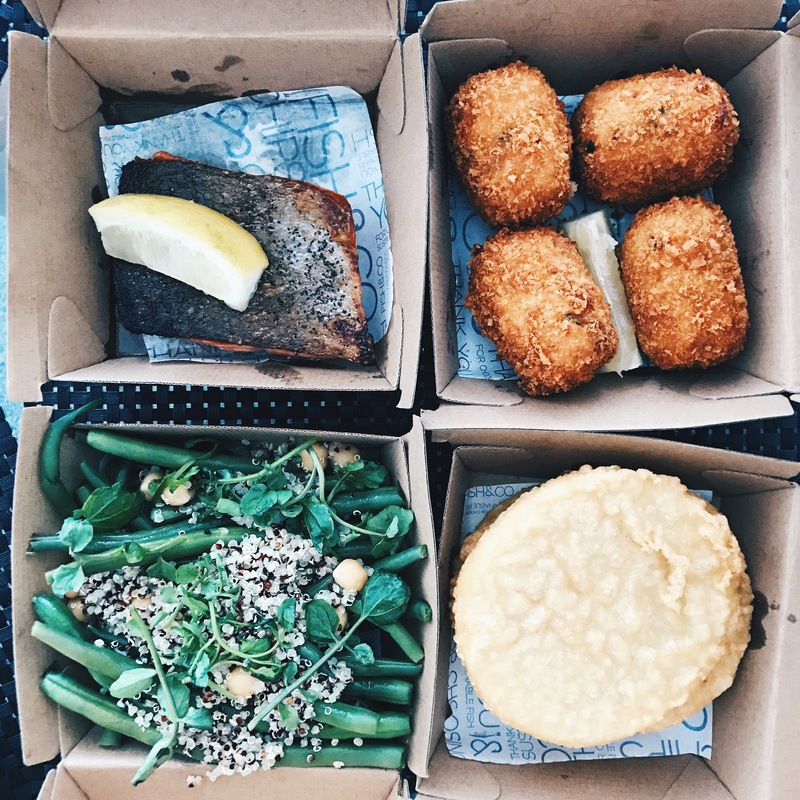 On a superbly lazy evening, we ordered Fish & Co via Deliveroo, a seafood place located at the Tramsheds. We had previously dined-in there before and the food was alright so we were keen to see how they fared with delivery. The salmon was extremely delicious and despite how far it had to travel, still maintained a very crispy skin. It is a really paltry size though for $21, it barely feeds one let alone shared between us two. But I suppose that might be the true cost of sustainable seafood. I love grain salads because they tend to be a texture explosion of different types of seeds, wheat and grain. This one should probably have been renamed green bean and quinoa salad because it didn’t have any other grains. The delivery thoughtfully comes with dressing on the side to prevent sogginess upon arrival but I opted out anyway. The beans were well cooked and still crunchy. I used to think potato scallops were just imitation scallops the way crabsticks made of surimi are imitation crab. But this year I had my first potato scallop and it was a mind-blowing experience. Incredibly crispy outer layer with insides as fluffy as the most buttery mash potato. A potato scallop, I am convinced, is the better looking and smarter sibling of a McDonald’s hash brown. While I’m no potato connoisseur, I think I’ve had enough this year to give myself some credit. Fish & Co’s were a great size, slightly larger than my palm and had the right width so as not to be too cakey. However, it didn’t fare well, as you’d expect most fried foods to be when they’re not eaten as soon as their out of the oven. Even more so when they’ve had time to steam in the container. The skin was a tad soggy. I don’t have fish cakes often, although I did grow up on the Asian variety which was more like a flattened fish ball or a fish paste disc. These mackerel fishcakes lasted a bit better than the scallops and still had a pretty crunchy exterior. However, I would’ve liked more fish in the mix, I think the predominant ingredient was still potato. Deliveroo is currently running a Christmas promotion where they’re waiving the delivery fee for your next 10 orders this month if you input the code ‘SANTA’ during checkout. Not a sponsored post.